Baker, W.J. (2009). Neotropical Arecaceae. Massive to minute woody monocotyledonous plants; trees, shrubs or climbers , sometimes fiercely spiny . Stems clustered or solitary, erect , creeping or climbing, often massive, sometimes very short and/or subterranean and thus appearing to be absent; usually marked with conspicuous nodal rings (leaf scars), sometimes dying after flowering. 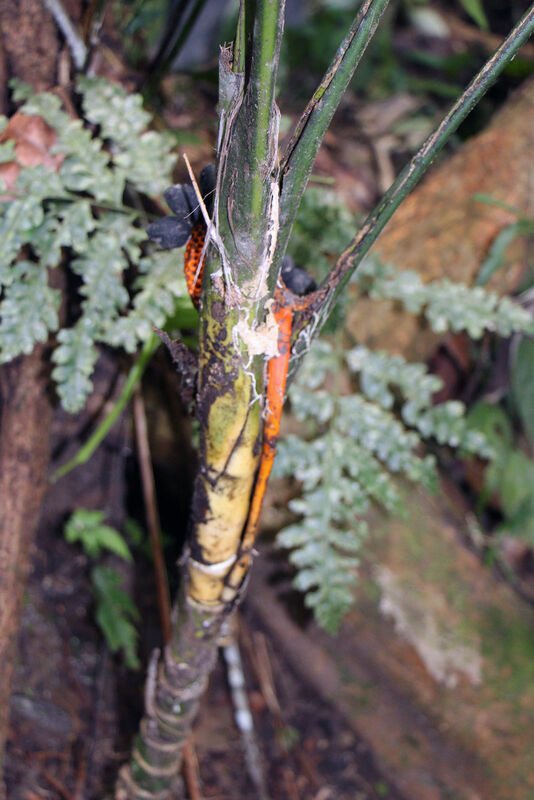 Aerial stems usually unbranched, but a few notable species branch by equal forking and other species branching anomalously. Leaves compound , less frequently entire ; compound leaves derived by splitting of an initially entire lamina , pinnate , bipinnate or palmate . Lamina almost always conspicuously folded. Leaf bases always tubular and sheathing (at least in the bud ), often forming conspicuous tubular crownshaft. Inflorescences always lateral , often massive, spicate to paniculate, sometimes aggregated in a mass of inflorescences held above leaves resulting in death of stem . Flowers: bisexual or unisexual ( monoecious or dioecious ), mostly following basic monocot ground plan (3+3+6+3), but with many exceptions, particularly in stamen number (e.g. over 1000 stamens in Phytelephas Ruiz & Pav. 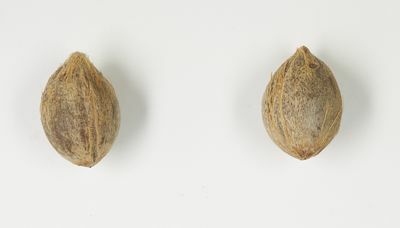 ); calyx and corolla distinguishable, often inconspicuous, but some colourful and enlarged; ovary always superior , always one ovule per carpel . Fruit berry or drupe ; minute to massive, usually 1-3 seeded, often brightly coloured, sometimes scaly or spiny . 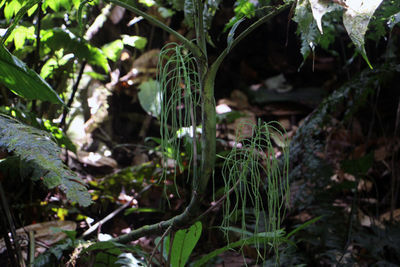 Widespread in Neotropics, especially in rainforest. For generic distributions see www.palmweb.org or literature below. 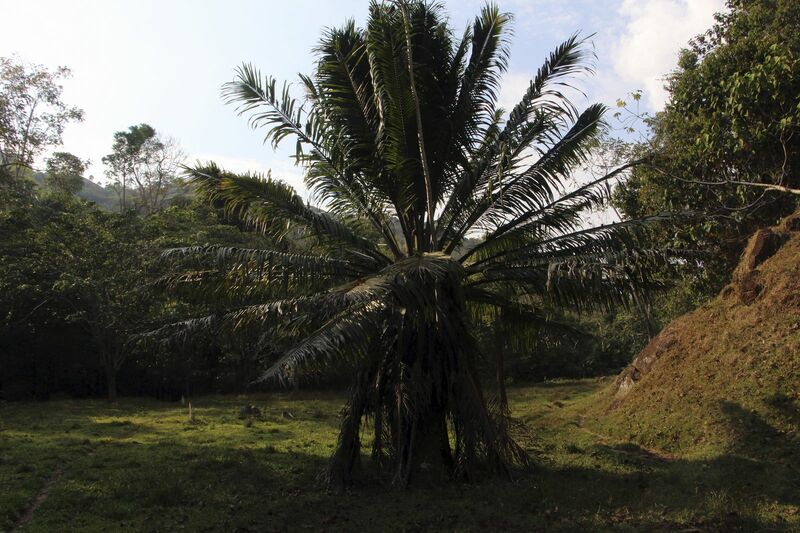 Distinctive palm habit comprising narrow, columnar, unbranched stem with crown of palmate of pinnate leaves. 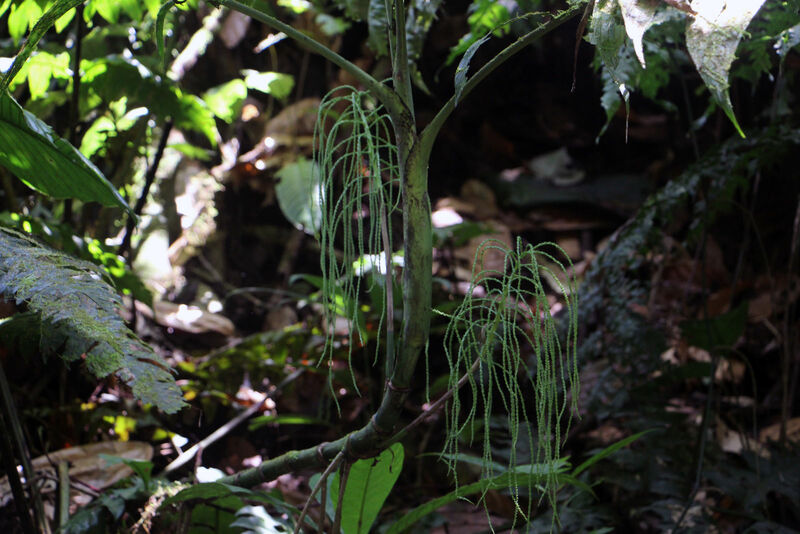 [Not in climbers, acaulescent or prostrate species]. Stem with distinctive ring scars. 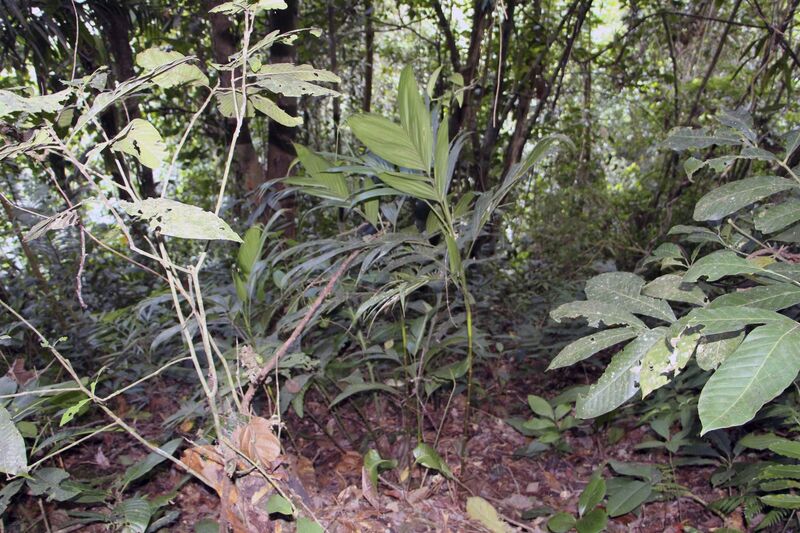 Leaves usually pinnate or palmate. Unique leaf structure and development - the lamina is plicate (folded), although in some species flattens with maturity. 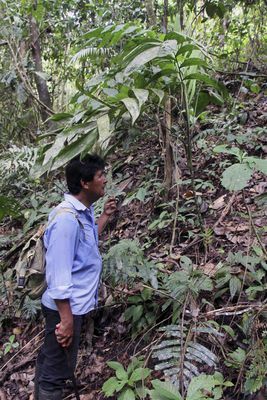 The compound leaf morphology is achieved by splits forming along the folds, resulting in pinnate or palmate leaves. [Lamina remains undivided in some species]. Leaf base forms a sheath. Rarely confused with other families except Cyclanthaceae. Palms are never rootclimbers (some Cyclanthaceae are rootclimbers). Palms do not have perianth parts in fours (Cyclanthaceaeperianth parts, where present, in fours). 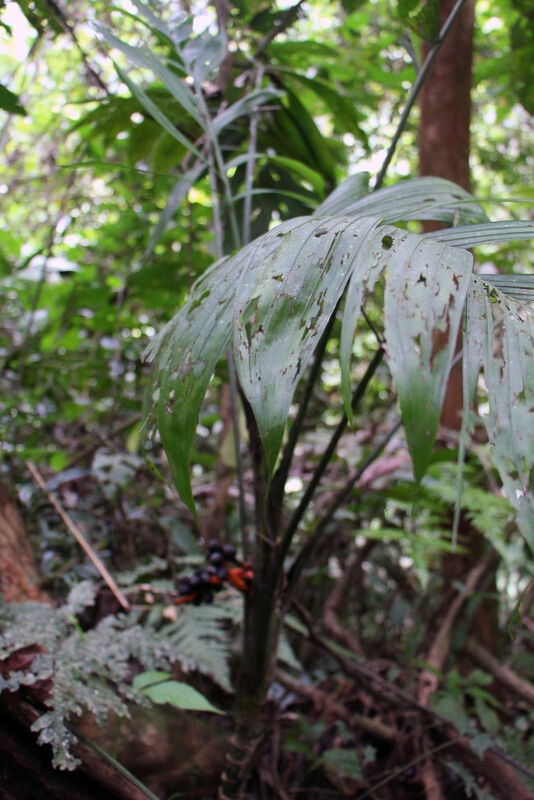 Cyclanthaceae leaves do not develop like palm leaves. Cyclanthaceae have distinctive inflorescence structure/organization (spicate, alternating male and female flowers) not found in palms. Ammandra, Aphandra, Phytelephas - the vegetable ivory palms, tagua. Stemless to short-trunked pinnate-leaved palms of Andean forests and neighboring areas. Dioecious with short-lived inflorescences, the males elongate and comprising numerous reduced flowers with up to 1000+ stamens, the females congested and consisting of the largest of all palm flowers (up to c. 20 cm long). 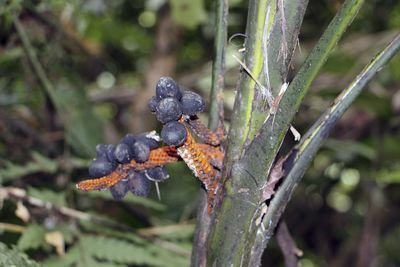 Fruits warty containing numerous seeds with hard ivory-like endosperm. Astrocaryum - viciously spiny stemless to canopy pinnate-leaved tree palms, leaf undersurface white. Attalea - American oil palms, often massive tree palms with huge pinnate leaves, visible in agricultural lanscapes. 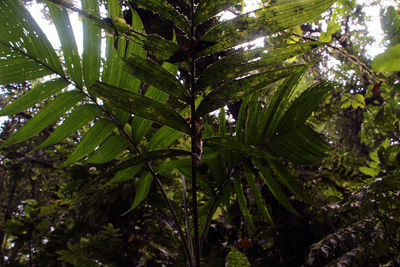 Bactris - most species rich of the spiny genera, undergrowth to canopy pinnate-leaved palms (sometimes entire -leaved), includes the peach palm Bactrisgasipaes (pejibaye, chonta, pupunha). 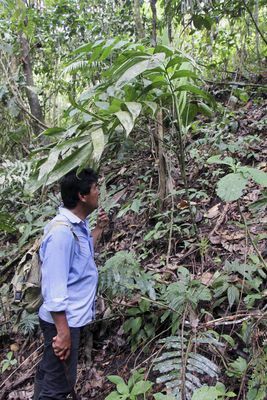 Ceroxylon - the Andean wax palms - conspicuous in Andean forests, pinnate -leaved, often very tall, stems waxy. Chamaedorea - most species rich palm genus in the Neotropics, most diverse in Central America, mostly slender understorey dioecious palms, pinnate- or entire-leaved, with flowers solitary (not in clusters) on the inflorescence branches. 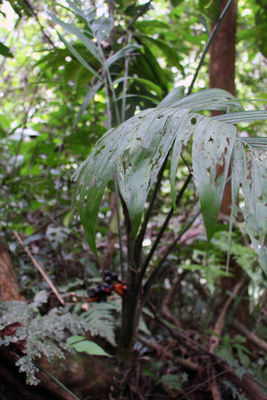 Coccothrinax - most species rich fan-leaved genus in Neotropics, largely restricted to Caribbean islands and Central America, slender to moderate palms with leaves unarmed and petiole base not cleft. Desmoncus - spiny climbing palm with pinnate leaves, rattan-like. 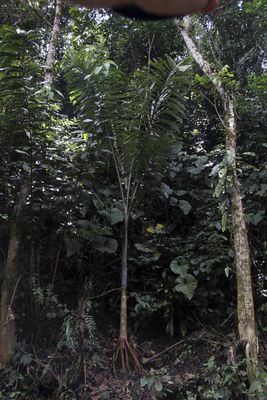 Dictyocaryum, Iriartea, Socratea, Wettinia - important and often very common stilt-rooted canopy palm species, with pinnate, often plumose leaves. 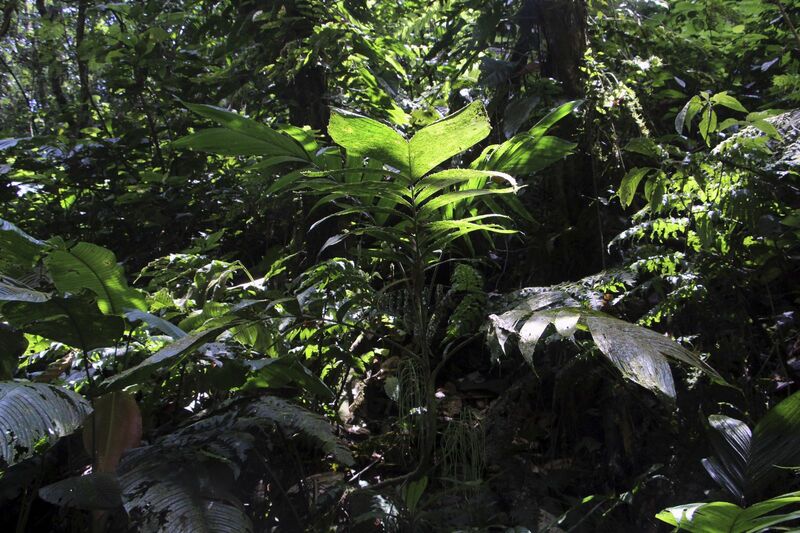 Particularly conspicuous in much of Amazonia and the humid forests of the Andes. Euterpe - assai palms. 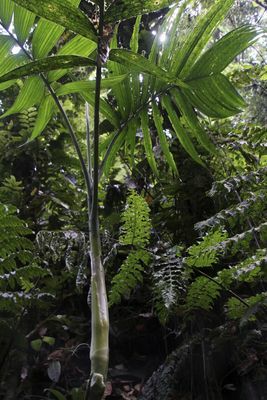 Moderate to robust, solitary or clustering pinnate-leaved tree palms, leaf sheaths tubular and forming a cylinder (crownshaft). Inflorescence resembles a horse's tail. Geonoma - most frequently encountered understorey palm genus in South America, mostly rather small, leaves pinnate or often entire. Inflorescences spicate or branches with flowers emerging from pits. Easily confused with related genera (e.g. Calyptrogyne, Calyptronoma, Asterogyne). 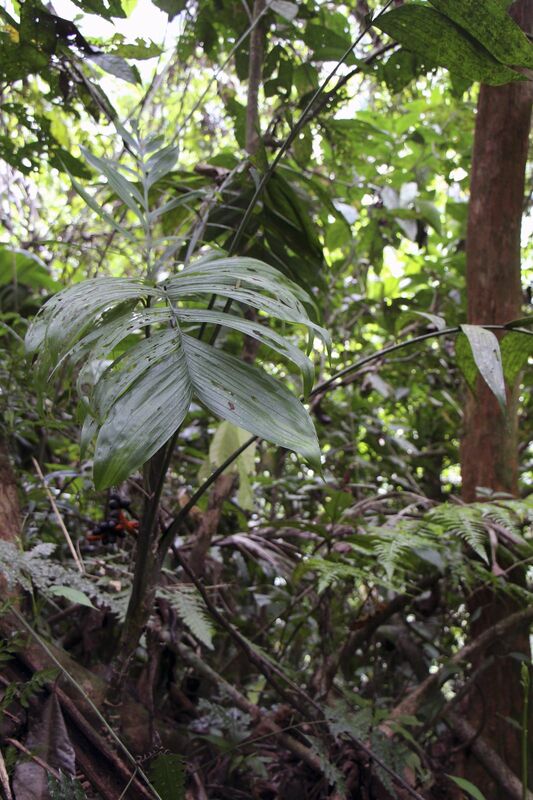 Mauritia - massive, solitary fan-leaved tree palm, often forming dominant stands in swampy areas. Moriche, buriti palms. Oenocarpus - Moderate to very large pinnate -leaved palms with inflorescences similar to a horse's tail. 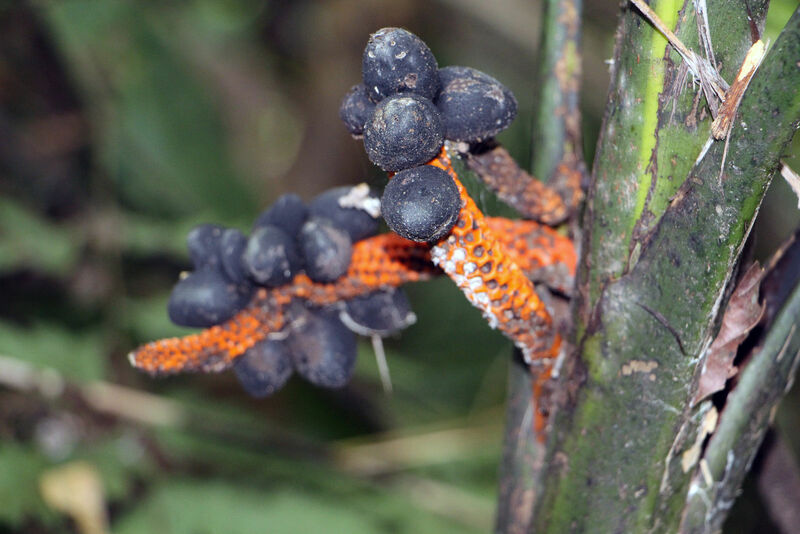 Asterogyne H.Wendl. ex Benth. & Hook.f. 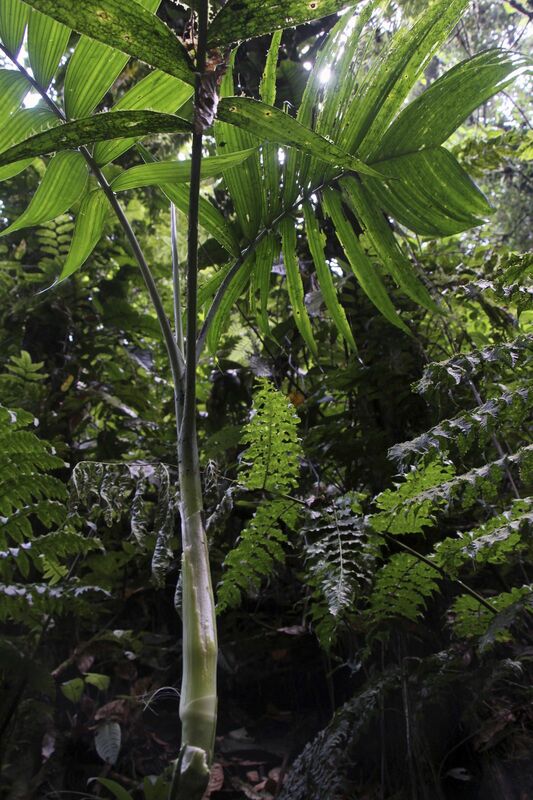 Pholidostachys H.Wendl. ex Benth. & Hook.f. Widespread and conspicuous throughout the region. Easily identified and often persisting in converted landscapes. The most important angiosperm family for resources extracted from the wild, unbeaten by any other family for its multiplicity of uses. Some species domesticated, others cultivated on a commercial scale. DRANSFIELD, J., N.W. UHL, C.B. ASMUSSEN-LANGE, W.J. BAKER, M.M. HARLEY & C.E. LEWIS. 2008. Genera Palmarum - Evolution and Classification of the Palms. Royal Botanic Gardens, Kew. HENDERSON, A. 1995. The palms of the Amazon. Oxford University Press, New York. HENDERSON, A. 2000. 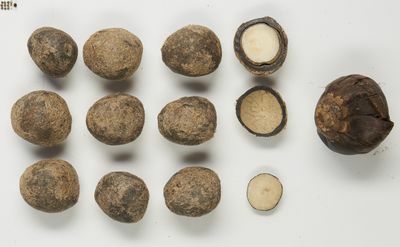 Bactris (Palmae). Fl. Neotrop. Monogr. 79: 1-181. HENDERSON, A., G. GALEANO AND R. BERNAL. 1995. 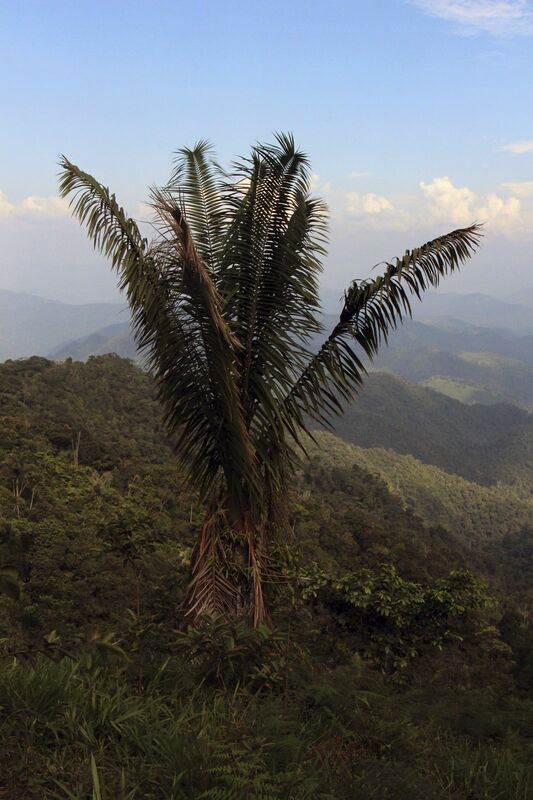 A field guide to the palms of the Americas. Princeton University Press, Princeton, New Jersey. Oncocalamus (G.Mann & H.Wendl.) H.Wendl.